A Toronto RV Trip is a great way to celebrate Canada's 150th with Good Sam. A Toronto RV trip is a great way to celebrate Canada’s 150th. The largest city in Canada, and by far its most cosmopolitan, Toronto offers everything from gargantuan skyscrapers to beautiful old mansions. Its large and multicultural population gives way to a wide variety of restaurants featuring cuisine from around the world. Celebrate Canada’s birthday with TO Canada with Love, a year-long Toronto celebration. This program features celebrations, commemorations and exhibits honoring the big sesquicentennial. More than 30 city-produced events take place across throughout 2017. Toronto is also an ideal spot for arts and culture aficionados, with a world-class theater scene and a wide array of spectacular museums and galleries. Families on a Toronto RV trip will find that there’s plenty for kids of all ages, from curious toddlers to thrill-seeking teens, and shoppers won’t want to miss the city’s world-class markets and malls. The largest museum in Canada, the Royal Ontario Museum was founded in 1912 and seems to have been expanding in terms of both size and collections ever since. Today, this gigantic museum has around 40 galleries and a six-million-item strong collection with everything from dinosaur fossils to fine arts. Natural history is an important subject for the museum, with galleries covering topics ranging from birds to biodiversity. There are also dozens of world culture galleries, with artifacts from as far as China and Greece, along with a gallery devoted to the First Peoples of Canada. Families won’t want to miss the CIBC Discovery Gallery, a hands-on area for kids, almost like a children’s museum within a museum. The Art Gallery of Ontario (AGO) is another not-to-be-missed museum, and it’s one of the largest galleries of art on the North American continent. Along with a regular rotation of visiting exhibitions, the AGO as its known has a number of permanent exhibits displayed across its numerous galleries, with themes ranging from prints and drawings to African and Oceanic Art. Those with an eye for architecture will appreciate the Casa Loma, a Gothic revival-style mansion and garden turned museum. Features include multiple decorated suites, an 800-foot-long tunnel, secret passageways and a sprawling garden that spans across five acres. Performing arts fans will get a kick out of the Royal Alexandra Theatre, which was built in 1907 and is the oldest continuously operating theater in North America. This Beaux-Arts building recently underwent renovations to upgrade the spaces and widen seat areas, with new seats identical to those from 1907. A Toronto RV trip leads to plenty of great attractions for the whole family. Thrill-seekers of all ages will love Canada’s Wonderland, one of the biggest theme parks in North America. While this enormous park has plenty of high-adrenaline roller coaster rides, it’s also home to kid-friendly adventures at the Peanuts-themed Planet Snoopy. 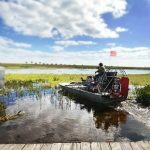 The park also offers an interactive dinosaur exhibit, Dinosaurs Alive, complete with life-sized animatronic dinosaurs and educational paleontology exhibits. 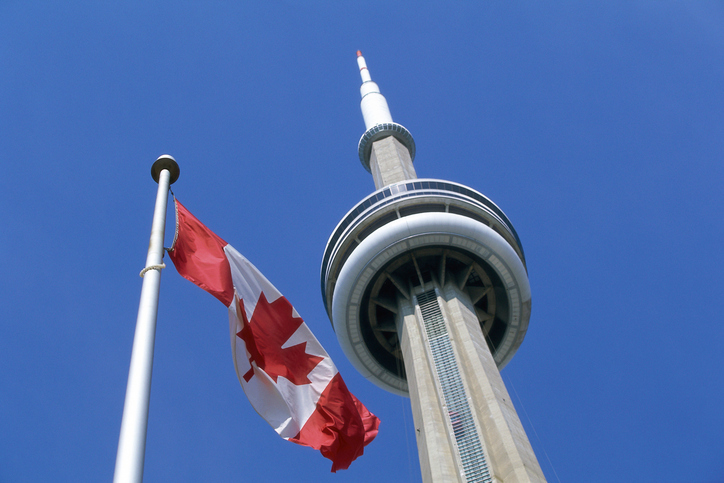 Visitors of all ages can appreciate the cityscapes from the CN Tower, which, at 1,815 feet, is the tallest freestanding structure in the Western Hemisphere. This communications tower features a viewing platform with panoramic city views and a revolving restaurant. Those traveling with daring teens may want to take them to the tower’s EdgeWalk, which allows visitors to get strapped in and walk along the exterior of the tower’s main pod. Ripley’s Aquarium of Canada is also popular among families and hosts more than 400 sea and freshwater species. Highlights include an underwater tunnel that goes through a tank full of sharks, plus an exhibit dedicated to jellyfish. Ice hockey fans will want to visit the Hockey Hall of Fame, which features memorabilia from Canada’s favorite sport, including trophies and equipment. Interactive exhibits enable guests to play in a virtual environment. Attracting around a million visitors per week, Toronto Eaton Centre is an enormous shopping mall with over 200 shops and a huge food court with around 900 seats. While it’s a great place to get all your shopping done in one go, those looking for a quainter shopping experience may prefer heading down to St. Lawrence Market. This enormous public market has been held since 1903 and is spread over three buildings, featuring all sorts of edible treats along with antiques, fresh produce and an array of locally handcrafted decor, apparel and accessories. More shopping and entertainment can be found in Nathan Phillips Square, home to dance performances, art exhibits and a farmers market during the warm months. In winter, the square’s pond is converted into a skating rink. 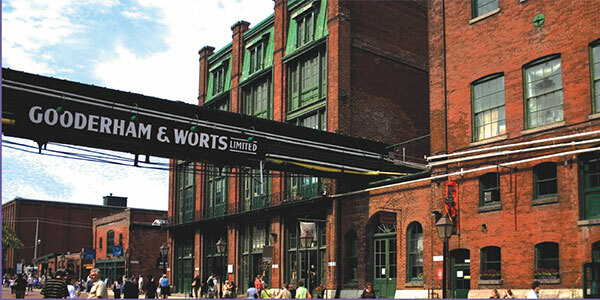 Another not-to-be-missed shopping area, the Distillery District is named after its former resident, the Gooderham and Worts Distillery, which was—at its prime—the largest distillery in Canada. Today, this revitalized district features over five-dozen boutiques, restaurants and galleries housed in beautifully restored red brick Victorian structures. Check out Tourism Toronto for more information.